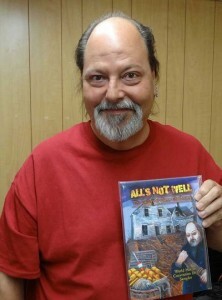 On June 26, 2013, The Lincoln County News published an article “Chadbourne Among The Notables At World Horror Convention”. Brian James Freeman of Cemetery Dance has posted images of the endpapers for their Gift Edition of Stephen King’s Doctor Sleep. The until-now-secret paintings are by Glenn Chadbourne. You can read more about them and see them on Brian’s blog site. Cemetery Dance has posted a new article about their upcoming Stephen King trivia books. Both books feature art by Glenn. You can read the article here.